These are Napco SYSTEM keypads. These are highly reliable hard-wired systems worth upgrading if the retro look isn’t your style. 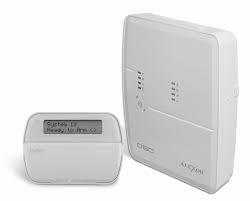 If you’re interested in upgrading to a newer system, keep the wiring, and change out the keypads and panel. Several great options are available. These are DSC keypads/ panels. Go wireless and add a cellular communicator. Add the app and control with your smartphone. $99 plus $8/mo for the cellular service, $2.50 more for Total Connect app service.